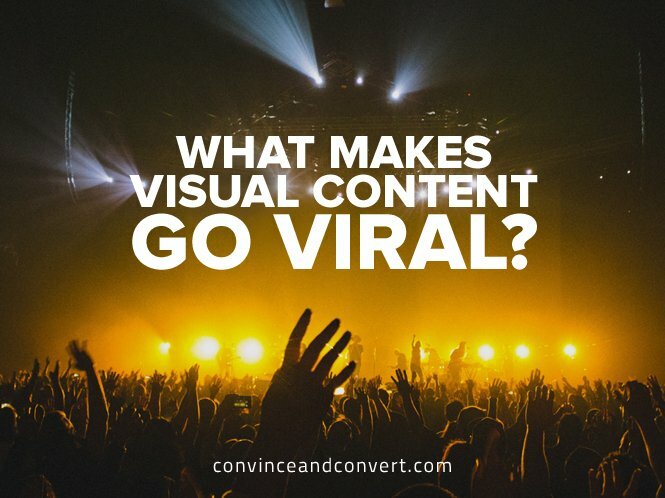 What Makes Visual Content Go Viral? It all seems to start with an unsuspecting subject. Consider Michael Jordan. In September 2009, Jordan was inducted into the Naismith Memorial Basketball Hall of Fame. He delivered an emotional speech about his prolific career that pushed him to tears. Who could blame him, right? Three years later, an image titled “Sad Michael Jordan” was submitted to MemeCrunch, and now—whether it’s the Golden State Warriors falling short of back-to-back championships or a video highlighting every death over Game of Thrones’ six seasons—you’ll inevitably find Photoshopped versions of just about any upsetting event that feature Jordan’s tearful mug. This is viral content at its best, and this intense wave of exposure has come to define our online behavior both as spectators and consumers. The caveat for brands? Saturating the web in a similar manner—specifically with overly promotional content—is proving less and less effective. So if you want to earn someone’s attention in a web full of crying Jordans, you need to produce your own organic viral hit—but is it possible to replicate something that seems so unpredictable? New research says yes, as long as your content aligns with the key emotional drivers that positively influence our sharing habits. 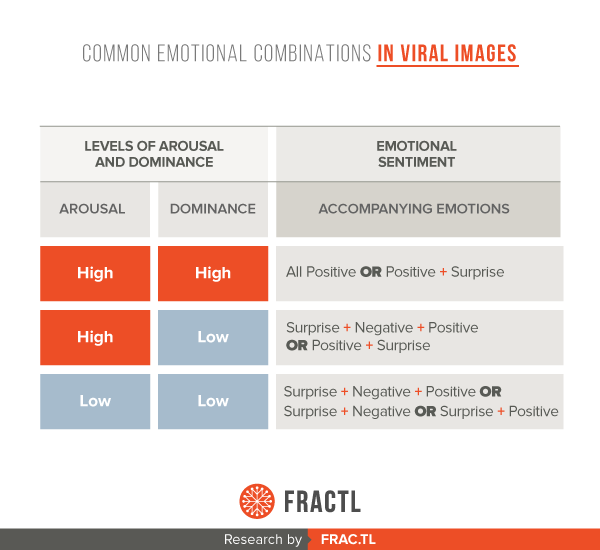 My team at Fractl recently discovered the ideal emotional combinations for viral images by using the Pleasure-Arousal-Dominance (PAD) model to analyze the emotional responses to some of the top images from Reddit’s r/pics community. 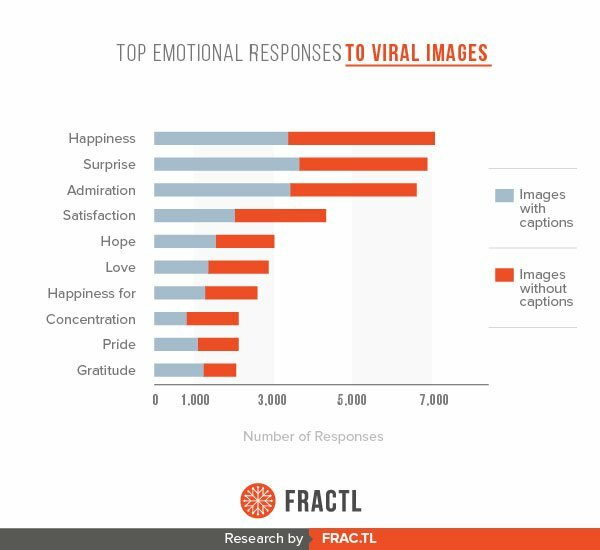 An obvious takeaway is that viral content tends to be incredibly positive, but our data indicates that negative emotions can still generate massive shares—you just have to strike the right combinations of arousal and dominance. Dominance ranges from submission to feeling in control. Fear is low-dominance; an emotion someone has more choice over, such as admiration, is high-dominance. Researchers Jacopo Staiano of Sorbonne University and Marco Guerini of Trento Rise studied the roles that valence, arousal, and dominance play in how content goes viral. A key finding from their study emphasizes how high levels of dominance—like feelings of inspiration and admiration—are connected to a greater number of social shares. Our analysis echoes previous research, in that viral content tends to be surprising, emotionally complex, or incredibly positive. However, this new data highlights the more nuanced combinations of arousal and dominance that are essential to boosting shares. When both arousal and dominance are high, the accompanying emotions are either all positive or a combination of positive emotions, plus surprise. If marketers want to create something highly shareable within these parameters, they should produce content that delivers a sense of admiration with a humorous twist. A great example is Nike’s highly successful “Better for It” campaign. As a less aggressive (but equally motivating) alternative to the brand’s iconic, “Just do it,” the video features the inner thoughts women experience while working out followed by the sense of accomplishment upon completion. The honest and humorous soundbites pay off: To date, the video has more than eight million views on YouTube. Let’s face it: No one wants to feel sad. It’s an incredibly negative feeling, but our research indicates it’s also a tremendously powerful emotion—and one that can leave a lasting impression when leveraged properly. 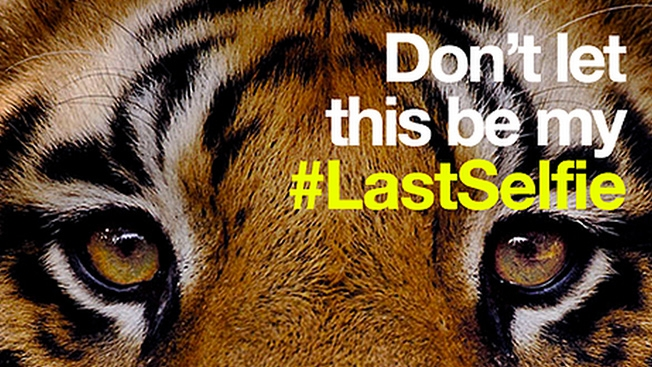 Consider Save the Children’s “Most Shocking Second a Day” campaign. It’s a heart-wrenching video that depicts the Syrian refugee crisis from the eyes of a child. It uses a familiar format but alters the levels of arousal and dominance so that audiences feel anger (a high-arousal emotion) and fear (a low-dominance emotion). Our research revealed that fear and distress were the most common negative emotions in this configuration, which is what helped this campaign generate more than 54 million YouTube views. Both of these campaigns indicate that if arousal is low enough, viral content can be primarily negative as long as it’s surprising. However, evoking high-arousal emotions such as fear or anger is necessary if your negative content doesn’t include an element of surprise. For example, although only two out of the 100 images in our study evoked purely negative emotions, both of these images made our respondents feel anger, fear, or distress. In an age where viral content seems to come and go within a matter of hours, it’s unlikely that your content will reach Crying Jordan levels of internet immortality. However, studies continue to prove that virality isn’t a matter of chance; it’s actually the result of a powerful emotional experience. Marketers who understand how to strike the right emotional chords with their content can yield surprisingly big results. When outlining your next campaign, take a look back at the top 10 viral emotions and figure out what levels of arousal and dominance you need to hit in order to get your content not just read, but shared. Andrea Lehr is a promotions supervisor at Fractl, a creative digital agency specializing in high-quality content creation and placement. She works alongside a team of creative strategists to produce innovative and unique, data-driven campaigns about industry trends. When she’s not in the office, there’s a good chance you’ll find her running or challenging friends to a game of Apples to Apples.